I’m a huge fan of shopping, especially online shopping. 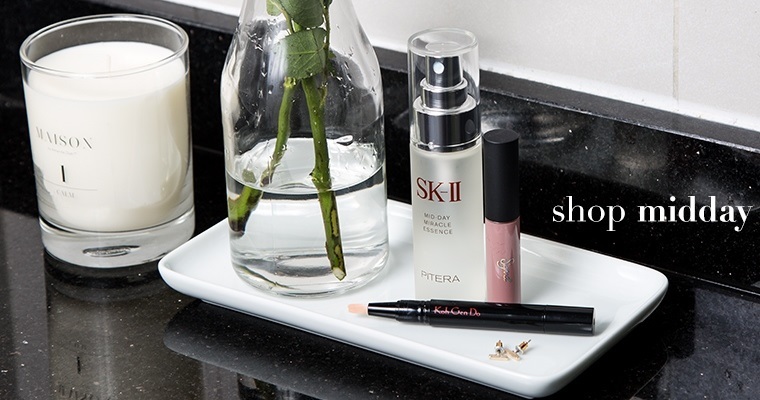 One of the main reasons why I shop online is because I can find pretty much anything online. Whether it is a new phone, home appliance, cosmetics, shoes, or even groceries, I can bet you that there’s a website specifically for it. One of the biggest questions for me is, What is the best online shopping website in Malaysia? and Where can I get the best deal? In most cases, I have to browse through 10 different websites to find the single best deal I can purchase. I must admit, it is quite a research. BUT! I’ve recently found a website that will do all of this for me in just a few clicks. Upon searching “online shopping website Malaysia” I stumbled upon a website called Priceza Malaysia. I have never seen this website before, so I gave it a try. On Priceza, I can search for all kinds of products, compare for cheapest price, and buy online. What is Priceza? Priceza is a price-comparison website for all kinds of products like cosmetics, apparels, shoes, electronics and much more! And I mean, much more... even groceries! This right here is what Priceza homepage looks like. I think one of the things that stood out to me is the layout of the website. Personally I think it looks really nice and easy to use. Unlike many other websites out there, they can be so messy. The very first thing I notice when looking at their page is the sliding banner at the top. The banners features mostly smartphones like the Samsung Galaxy S5, HTC One m9, Lg Nexus 5 32GB, Asus Zenfone 6 and Sony Xperia X3. If you look closely at the banner, you can see prices of that product and from which store listed next to the product. Scrolling down, you will have a quick look at products that are currently on discounts. It is under the tab “Special Prices.” As you can see, there are products from different categories featured under special prices. You also have the option to click on the “Product Ratings” tab, which I could see popular products, most liked products, most wanted products, and most owned products. Talk about staying up with the trend huh? It seems to me that Priceza has everything imaginable for online shopping. Which gives me the idea, let’s test it out. To be honest, I’m not very familiar with a price-comparison website. Earlier, I saw a banner features the new HTC phone. I scrolled up to the top of the page and went ahead typing in HTC One M9 in the search bar. Then, hit search. After hitting the search button, this is what the result page looks like. The very first thing that came up is the HTC phone that I want. Towards the left, there are different check boxes that allow me to narrow my search such as product categories, brand, memory size, and even price range. I think this is a great feature. One of the things that frustrate me in the past is when I try to search for something, and a million other unrelated things also came up. This will help me remove the products that are not relevant to my search. Pretty nice! Looking towards the right, the black button has “Compare Prices” written on it. So why wait? After hitting compare, it takes me to the HTC One M9 product page. Look like the lowest price is currently RM 2,005. What’s useful is that it also shows which merchant is offering the lowest price for my phone. Instead of manually going to each website one-by-one, Priceza has done the job for me. 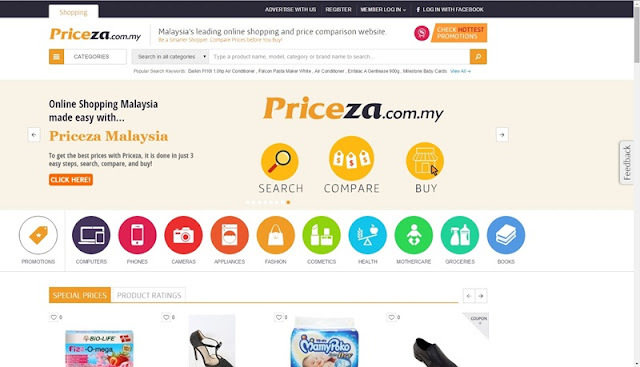 It seems to me that Priceza has partnered up with major online shopping websites in Malaysia. There is also a tab to see user reviews for the product. It has a product description which talks about the phone’s specifications and features on the page as well. I think it is especially helpful to read the reviews of the website that you are going to buy from. You want to make sure that you are paying for a legitimate product, and that you will also get a great customer service if problem arises. It is always better to be safe than sorry guys. 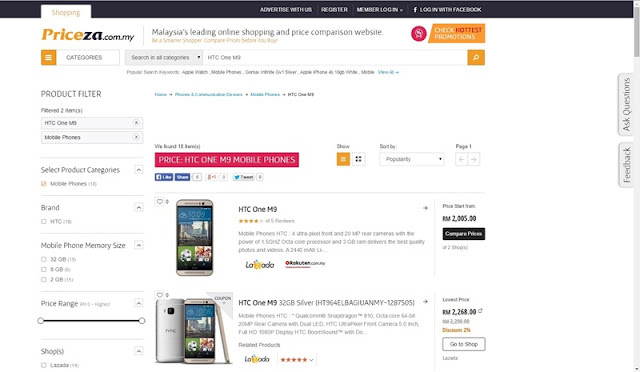 Moving below that, I can also have a quick view of the related products of the HTC One M9. Currently, the website is suggesting other HTC phones such as the HTC One M7 or the HTC One M8. And below that, it also shows recently viewed products. I believe this is a good feature because I am one of those people that accidentally close windows and tabs all the time. This acts like a “history” page for my product search. So far, the website is quite useful. Going back the homepage now and I want to check out what other things that Priceza has to offer. I checked out their “Guide” page and this is what it looks like. There are a wide range of contents that I can read. Most are about new product release, product reviews, news and also lifestyle tips. Bingo, let’s check one out! I clicked on the “HTCOne M9 vs. Samsung Galaxy S6: What's The Best Phone for 2015” content. After clicking that, it takes me to article page. After reading the article, there are related products that are being discussed in the article right at the bottom of the page. I wanted to check out some of the promotions out there that I can take advantage of. So, I went back and click on the “promotions” button. This is what their promotion page looks like. As you can see here, Priceza have compiled special promotions and campaigns that are being offered in many shopping websites. I think this is great. I mean think about it, you don’t have to subscribe to all these websites to get a “coupon” that eventually end up in your junk mail folder. 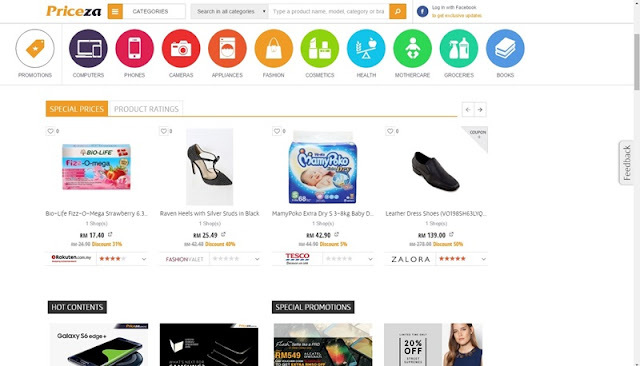 Currently, Priceza features promotions from kitchen, electronics, apparels, all the way to beauty products! So no matter what kind of a deal hunter you are, you can probably make a good use of this. 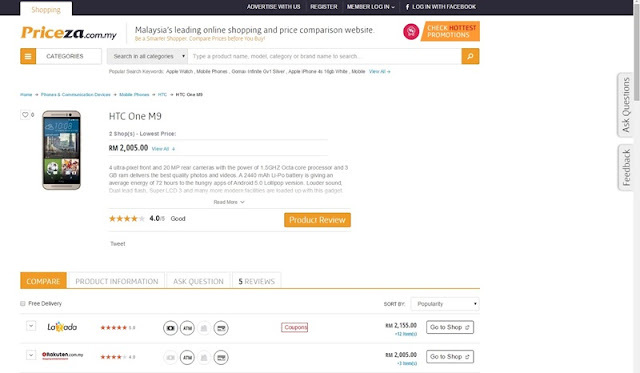 All in all, I think Priceza Malaysia is a great shopping website for a few reasons. It is a website where shoppers can make the most out of their online shopping. Not only that I am able to search for a wide range of products I want to buy online, but it also gives me the option to compare and make sure that I am getting the best deals out there. 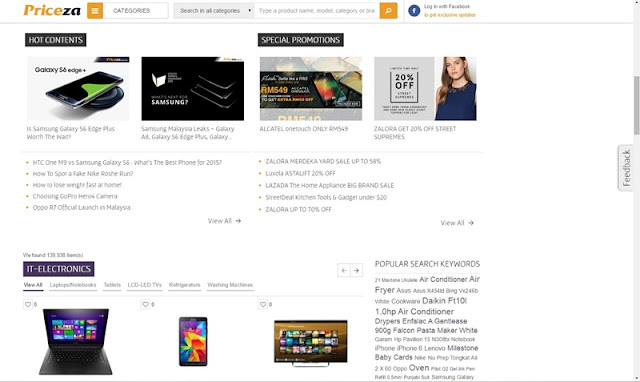 I can also check out amazing promotions from all over Malaysia, and read useful product reviews that will help me make a better buying decision. It is essentially a one-stop-shopping website where I could save two of the most valuable things in life, and that is time and money. Priceza is a useful website that makes shopping convenient.